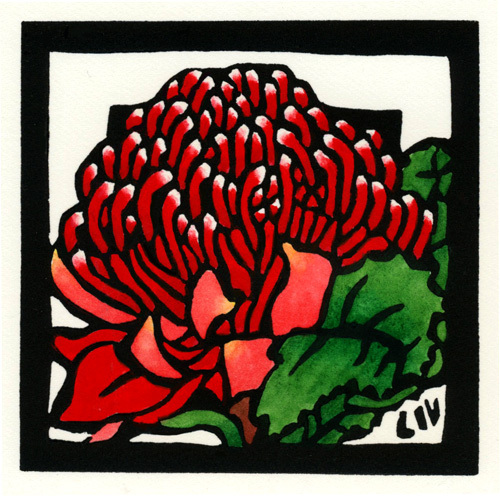 I have recently been working on preparing a couple of my linocut design images for licensing. I usually always scan at 300dpi and keep these large images. I then reduce these to a much smaller 72dpi for web use. I keep all these scans on an external hardrive – backed up with another external and occasionally I burn them onto gold discs for storage. For a variety of reasons including ‘life interfering with art’, my filing and storage systems are a tad disorganised (well let’s face it more than a tad disorganised) so I have been making the effort recently of going back and refiling these images. So when I was asked to provide the 300dpi images for these design I thought ‘no worries’. Wrong … not only could I not find the original 300dpi image there were numerous 72dpi’s indicating I probably saved over the original image with the smaller resolution … sigh number one. Well that’s not really a huge deal I will simply go and find the original proof that always keep filed away in my ‘dry cupboard’ for safe keeping. Wrong … I had this really big clean out and rearrangement of all my cupboards and filing systems for my prints last year … so is that little print there .. .no … sigh number two. Well this is inconvenient but not again not really a huge problem I will simply reprint the proof and repaint it. 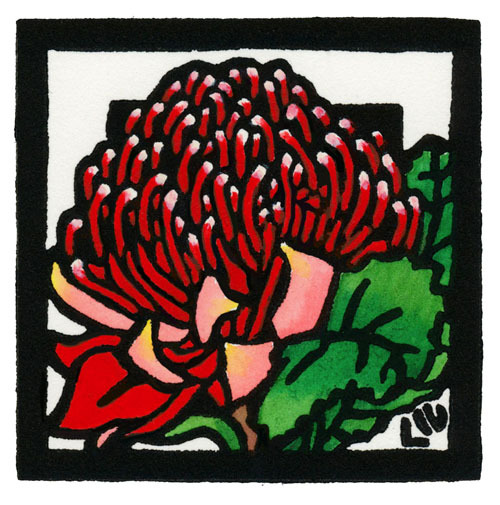 Wrong a third time … the particular lino I had used was a very soft red/brown lino that I had used as the Silkcut lino I usually use was not available locally at the time and it was in the midst of Silkcut revamping the colour (and consistency) of their lino. When I reprinted the design it simply would not print cleanly and in fact the lino seemed to have become ‘gluey’ so cleaning out the carving simply did not work … no longer sighing but seriously huffing!! Was it the paper, ink, lino or just me? So I tried again after attempting to clean up the linoblock with the lino carving tool. This change in the lino could be related to many factors including the humidity of where I live – I am not really sure why this has happened and have never had it happen before. So the only thing to do was to re-carve the design with the lovely grey silkcut lino I love working with. Below are the two lino blocks. In fact when I can now compare the two the silkcut has more ‘body’ to it and is better able to hold the shape of the carving and allow for finer carving. So how does the carving between the two different types of lino compare when printed? 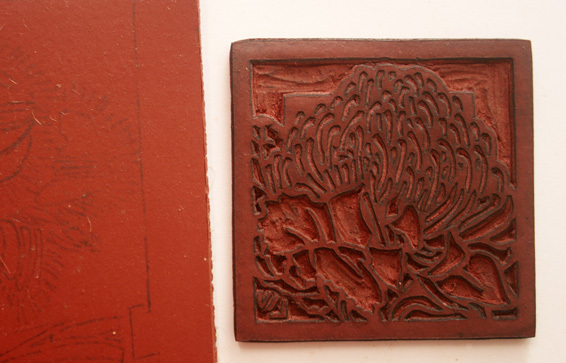 This is the red linoblock after handcolouring – the smaller images show the ‘rough’ edges where the lino has not printed clean lines – especially annoying give the time I take to make sure the edges are as clean and sharp as possible. Definitely not good enough for commercial printing for me. So the results of taking the time to re-carve the linocut design? I think they speak for themselves. Wow, what a saga! How lucky you at least had the drawings to transfer onto the new linoleum. Sure hope you don’t discover more images with this problem. Thanks for your post, Lyn. Your problem with storage reminded me of my own. Especially of a ‘what if’ scenario of a studio fire taking out the original art & computer files. I’m looking to uploading my files to one (or more) free online storage sites. Reminder to self – engage brain ….